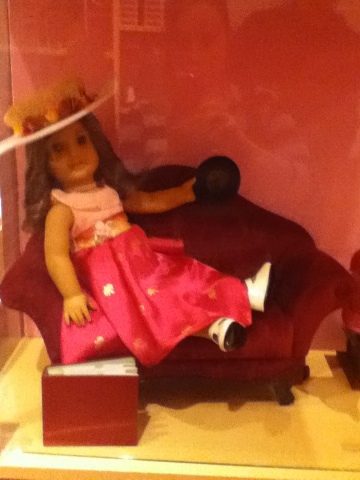 I went to the American Girl store in Tyson's Corner ( Washington DC ) for the first time yesterday. I will have to say that I'm still undecided about if it lived up to my expectations. I'm still debating on if it even lived up to the reviews and comments I've heard from others. 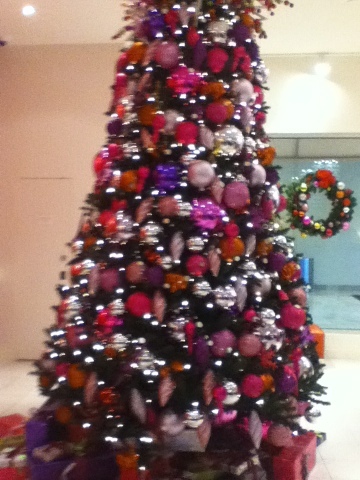 The decorated Christmas tree with its pretty pink and purple ornaments was nice, as was the wreaths in the windows. Some of the displays were absolutely beautiful, while others were very lackluster. I enjoyed seeing Caroline's collection and all of the My American Girl dolls. There were no McKenna items to be found in the store other than the doll ( I had already bought one ) and I understand that almost everything in her collection is back ordered, or at least there, sold out. I thought a lot of the My American Girl items look better in the catalog than in person. I had several including a holiday outfit that I was interested in purchasing, and upon seeing them in person ruled against all of them. On the plus side the store exclusive doll bikini is cute, as are the exclusive treat set and dishes. Overall the experience was just that, an experience, not good or bad.